Hilaro Siquera used to own a 243-hectare farm in Divar, about 6 km from Goa's capital, Panaji. His land isn't cultivable any more saline water has claimed most of it. Most of Siqueria's fellow cultivators work as daily wagers, their farms having been reduced to mosquito-infested swamps. Divar's 400-odd farms are no exception. Goa's agro-ecology based on khazan lands is on its death throes--a victim of the development strategy followed by the state in the last few decades. Magic on mangroves Khazans are low-lying coastal saline lands, reclaimed from mangroves. According to Nandkumar Kamat, professor of microbiology at Goa University, "After 400 ad, brahmins from northern parts of the country colonised these lands facilitated by charters from local rulers". Cooperatives known as gaunkaris, and later also as comunidades, engineered an intricate system of bunds and sluices. Local knowledge of the tidal clock and principles of salinity regulation played a key role in the maintenance of the khazan infrastructure. "Khazan lands have been subjected to planned and contour-integrated topo-hydro-engineering by local communities to produce reasonably sustainable productive agro-ecological and agro-economical systems," says Kamat. These lands are also remarkably biodiverse (see box Merry life in Goa). Three-tier precision Estuaries, mangrove areas, outer and inner embankments, backwaters, creeks, sluice gates and drainage canals are important components of the khazan system. The lands are protected from tidal ingress by a three-tier defence system consisting of outer embankments or bunds, mostly built with locally available laterite stones, inner embankments made up of mud, straw and poles, and sluice gate. The inner embankments regulate the flow and circulation of river and monsoon water. The wooden sluice gate is strategically located depending on the contours of the land. Its wooden shutters open and close with pressures of the tidal flow. Most shutters are supported by frames built with laterite and mortar or cement. These shutters need repairs when they are attacked by wood-boring organisms. At the end of the khazan lands is a depression called poim, which is the lowest level of the low tide. This acts as a stormwater receptacle and protects agricultural fields from high tides. The sluice gate mechanism regulates water in the poim. Khazan lands are internally connected by cross-drains for smooth circulation and drainage of water. 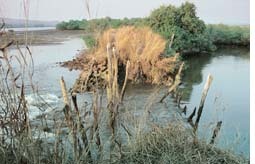 The mangrove vegetation near the outer embankments acts as wave breakers and reduce the erosive power of the tidal waves. Disrepair and despair Luis de Souza, a farm owner in Divar, elaborates on the three tier-system. "Maintenance of bunds is crucial," he says. "If the breaches are not repaired in time, they grow big and salt water enters our fields. Saline water also leaches into the groundwater, turning well water saline," he says. That's exactly what's happening in the khazans today. The bunds are in a state of disrepair and the communidade system is falling apart. Seventy-year old Matis Pereira, attorney of comunidades in Divar, explains, "All bunds are supposed to be repaired and maintained by tenants' associations, which came up in 1964. Sluice gates are auctioned each year and the proceeds go to the associations, which use the money to maintain the bunds. But bidders (who use their control of the sluice gates to run lucrative fishing businesses) do not pay the installments.The associations have no recourse but to approach mamlatdars (district magistrates). But complaint redressal is hobbled by corruption." The state agriculture department's soil conservation division is responsible for making estimates of repairing costs, they are then supposed to recommend that the government give a 50 per cent subsidy to the associations. But subsidies don't come and most of the cultivated areas are now spoilt. Paddy has gone waste. 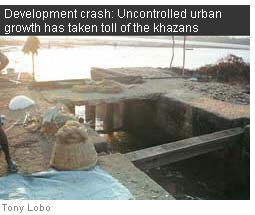 "Development activities have also had significant impacts on the ecology and economy of the khazan and estuarine areas. The pace of degradation of the khazan ecology has increased in recent years due to short-sighted planning, public apathy, industrialisation and urbanisation," says Kamat (see table Development impact). "Apathy has destroyed the islands," laments Pereira. Increased salinity is sure to turn the islands to their original mangrove state. "This might increase the ecological value of the khazans, but their economic value is substantially reduced, because of the agricultural losses," de Souza explains. But then it's a whale of a time for those practising pisciculture, he adds. Most like him know what it would take to correct the system. But the measures on the ground are zero.